Is Nvidia's new mobile Tegra chip the future of computing? In what rates as one of CES's most compelling keynotes, Jen-Hsun Huang Co-founder and President of Nvidia drew rapturous applause from wowed tech watchers with his demonstration of the Tegra mobile chip. The processor is intended to give portable devices the power of desktops yet, in Huang's words, "only sip power". He described the chip's creation as: "the greatest undertaking since our foundation." Current mobile devices just aren't up to the job – web pages don't fit naturally onto small screens, they're generally under powered and so can't play HD content. If you're a gamer you can forget playing the latest 3D titles on your mobile. What's more, if you attempt to do any of these things you'll wind up with an unwieldy device which guzzles power. Huang's message was simple: "We need a new device." One with the power of a desktop yet with the convenience of a smartphone. We need a tablet PC and to make it happen we need a radically new processor. 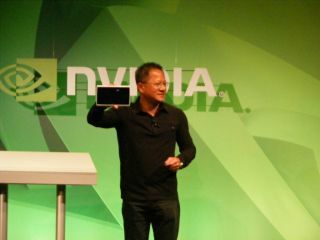 Lifting the curtain on Tegra, Huang introduced the new chips as: "nothing short of a miracle." The chip, it's claimed, is capable of driving HD video and has the muscle to run games currently only seen on PCs and consoles. Despite its computational muscle the chip consumes about a twentieth of the power needed to drive a top flight PC. By comparison mobile phone processors are made to look puny with Nvidia claiming Tegra is ten times more powerful than the average. "We need the performance of a PC and the power sipping characteristics of a mobile chip, " Huang said and Tengra is it. With the twinned benefited of very low power consumption and high compute power, Tegra powered tablet PCs should be amazing. The chips frugality should make the next generation of tablet PCs very compact. Huang explained: "When you consume very little power you can make the industrial design exquisite…[Tegra needs] no power management, no heat pipes, no ventilation, just electricity. Turn it on and it works." It will, in short, allow designers to create a whole new form factor. It's claimed early devices built on the chip are as frugal as promised. One managed to play over 140hrs of music – the equivalent of 200 CDs – without need a charge. If you're a video fan you can expect around 16hrs of playback before needed to recharge. Put it another way you could fly to any destination on Earth from anywhere and watch HD movies and never need to recharge. In other demonstrations a Tegra powered tablet made easy work of a lavish 3D shooter running on the Unreal engine. The chips, according to Epic Game's founder Tim Sweeney, make mobile devices and PCs work in lock-step. Such is its pixel pushing power we can look forward to games running equally well on PCs, consoles and also tablet PCs.